Struck by lightning, bitten by a cobra; Kung Fury might just be the new 80’s icon of the 21st century. Born from a fake trailer created by Swedish animation whizkid David Sandberg that went viral, a Kickstarter campaign would raise triple the required funds, and thus, the epic short film I am reviewing became a reality that would go on to take the Cannes Film Festival by storm. 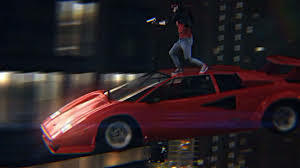 Kung Fury is a love letter to the 80’s, first and foremost. Much in the same way Astron-6’s masterpiece Manborg is; a movie Kung Fury will inevitably draw comparisons to. 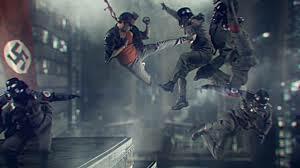 Inspired by everything from Saturday morning cartoons, Cannon Films, arcade video games and B movies, Kung Fury is a live action scrap book of 80’s pop culture nostalgia, brought to life in a basement of a little house in Sweden. 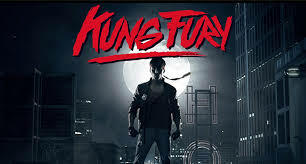 Kung Fury is the story of a kung fu cop of the same name, who must travel back in time to put a stop to the ”Kung Fuhrer” Adolf Hitler before he comes to the present to usher in a Third Reich. Along the way we meet Norse gods, viking babes with guns, T-Rex’s, killer arcade machines and Fury’s partner, Triceracop – a half man/dinosaur police officer. In true 80’s style, we’re naturally treated to a rocking 80’s electronic soundtrack composed in retro Heaven by mystical synth Gods. Kung Fury is played by David Sandberg, whose deadpan delivery of cheesy one liners makes him a caricature of video store action heroes of yesteryear. As a filmmaker he’s brimming with so much imagination and so many ideas it’s surprising he doesn’t have leftovers pouring from his nostrils and ears. This is a Jack of All Trades to say the least and I can’t wait to spend the rest of my life as one of his obsessed fanboys. Don’t take my word for it though. Check it out for yourself. It’s FREE!